Fitting all the essential information about your brand or product into a brief document can be an arduous task. This Fact Sheet template simplifies the process, providing a foundation to help you extract relevant pieces of information and elegantly lay them out on a page. Create your Fact Sheet now for free! Your starting point to create and share beautiful fact sheets, without any design experience. 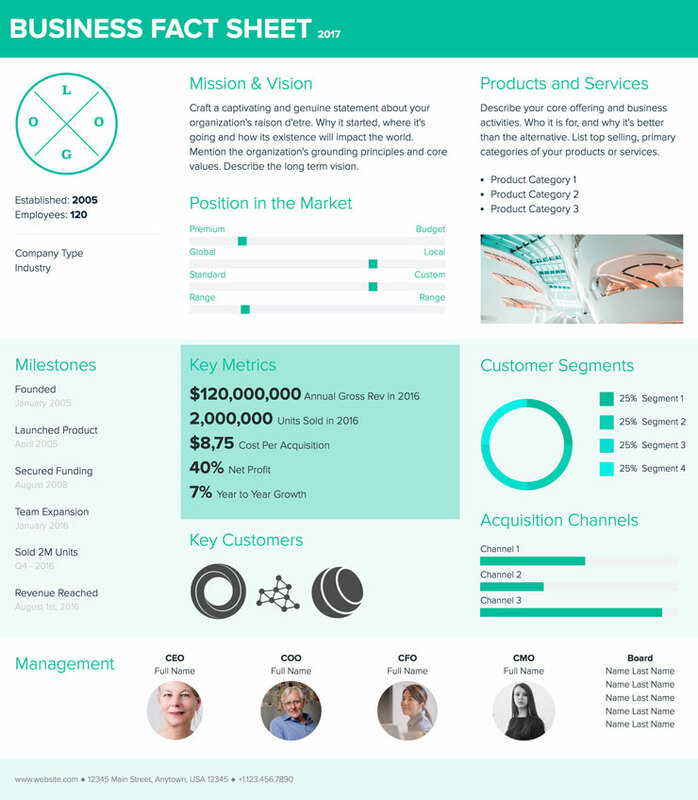 The Fact Sheet is a simple overview of important information about your company, startup, and organization. It is an easy-to-skim, compact, and concise summary of your business that can be adapted for many purposes. Why create a fact sheet? Pinpointing the purpose of your fact sheet allows you to properly customize and distribute it after completion. Xtensio’s sharing features give you a range of control to make your fact sheet anywhere from super-private to very public, depending on your needs. How to organize the facts on a single page? As you start building your fact sheet, think about the type of relevant information you want to include. For example, a fact sheet made for sales or marketing should focus on presenting straightforward product/service information to pique the audience’s interest. A fact sheet made for internal reporting should include analytics on business growth and other key metrics. The flexibility of Xtensio’s editor allows you to easily modify and sort your information so that the Fact Sheet adapts to fit your overarching purpose. Ideally, your fact sheet should fit on a single page. Creating a good-looking fact sheet from scratch is difficult, especially if you’re not a designer. The header gives the fact sheet a general direction and acts as the title of the page. You can add dates and contact information in this section as well. Remember, by sharing your folios as responsive links, you can change your header, turn it on/off, and refresh its date to update anyone who has the folio link, anywhere in the world. Use this section to provide a brief description of your company. Include essential facts such as your company size, date of establishment, company type, industry, location, a few keywords that summarize your business, and your company logo to reinforce brand recognition. Feel free to add any other information about your product, service or company as it pertains to the fact sheet’s overall purpose. Fill out the Business Model Canvas PDF to pinpoint key company information and streamline planning, development, and execution across your business. Insert your contact information, website, and relevant social media links into the final section of your fact sheet. Add a clear call to action that aligns with the purpose of the fact sheet. If this is to capture investor’s interest, insert an email form module. If you are using the fact sheet for sales purposes, include a number to call, or email to reply to. Pro tip: If you’re looking for a template to test an idea or measure interest, you can also check out the one-pager template and the landing page template. These both include an email form module so you can collect email addresses for marketing and bizdev. Write a brief but detailed definition of your organization’s raison d’etre or use a simple bolded company slogan in larger font. Explain your organization’s grounding principles and long-term objectives. You can also add tags or graphs to your folio to add visual indicators of your company’s values. How does your brand benefit your customers? What advantages do you hold over your competition? 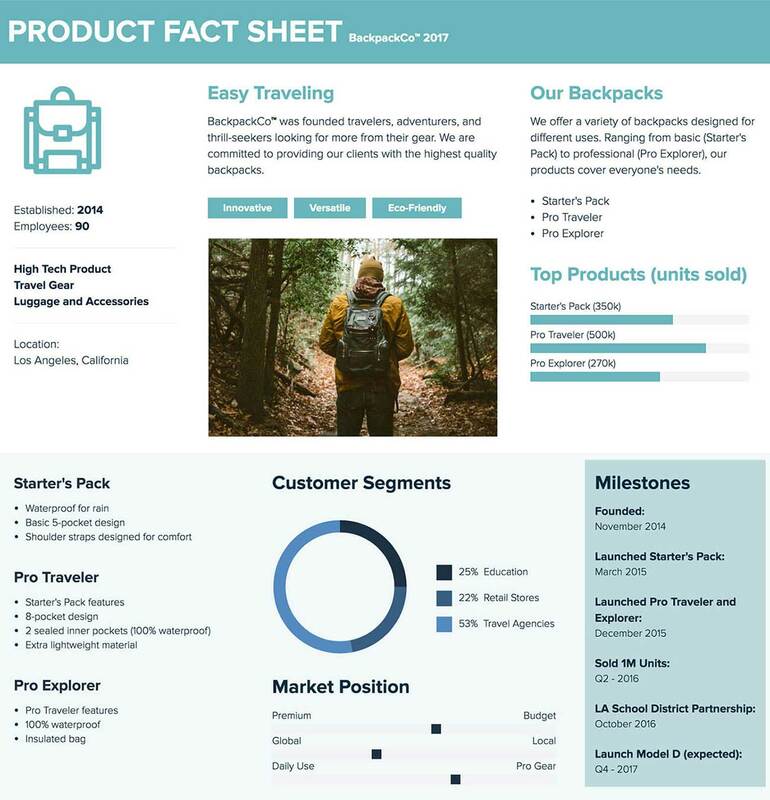 If you are creating a product fact sheet for sales or marketing (example on the right), consider listing out and comparing your top products. Utilize graphs to show metrics. Insert images or icons to describe features. Caution: Keep jargon to the minimum. Only use the most vital information to cite sufficient facts and peak your reader’s curiosity to learn more. 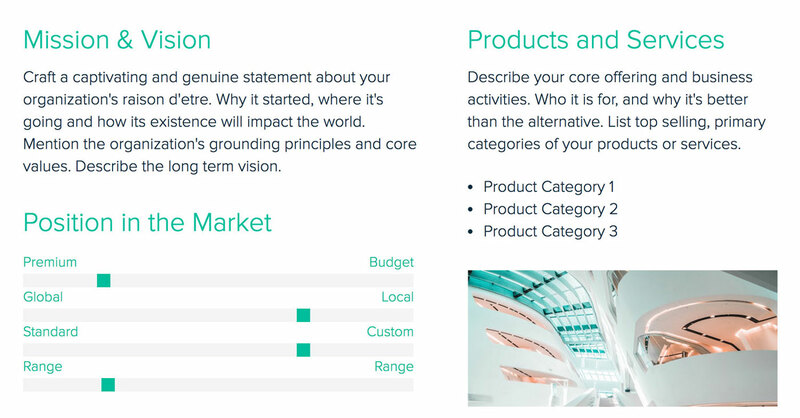 This module helps you display an overview of the industry ecosystem and show where your company stands. This provides your readers with some general context for your organization. Use a scale chart and other modules to diagram the industry realities and existing alternatives to your product or service. 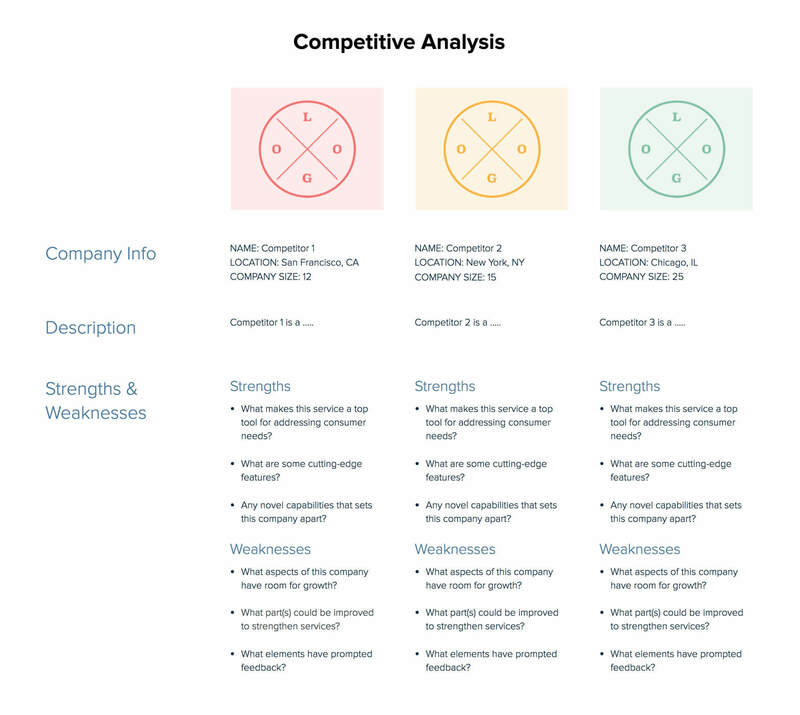 Fill out our competitive analysis for a deeper look at the market and where you stand next to your competitors. Listing out your milestones gives both the team and your stakeholders a sense of your organization’s accomplishments. Write down turning points for your company: product launches, fundraising rounds, sales and revenue milestones, usage metrics. This gives an overview of your progress and adds credibility to your business and product. You can also insert a table to show more detailed dates and metrics. Lay out the Key Metrics that represent your progress. Show relevant and overarching metrics that are based on normalized data captured over the course of a significant amount of time. These metrics could address the methodologies through which you will measure success, such as conversion, retention, and churn rates. For startups that may not have enough data to work off of, use applicable industry related metrics that showcase the potential of your idea. If you’re creating a fact sheet for investors or internal reporting, consider expanding this section to show your growth and attach an investment table. The editable examples on the right are investor intro (top) and internal reporting (bottom) fact sheets made through Xtensio’s templates. The consulting services proposal and the pitch deck template are also great ways to show potential investors and clients why your product or service is valuable. Caution: Avoid hyperbole such as – this is a billion dollar industry. Every industry is, and it does not prove that you will get a slice of it. Be specific and list only concrete information. Who are your customers? Are you mainly dealing with enterprises, small businesses, or individuals? Organize your consumer base into Customer Segments to provide the audience with insights on the value your product or service offers customers. If you have any Key Customers, you can add them by uploading their images into this module as well. Visually characterize your customer interactions with Acquisition Channels. How do people discover your company and start using your product? What are some methods you use to reach your customer base? Slide the bar based on each channels significance to your overall goals. 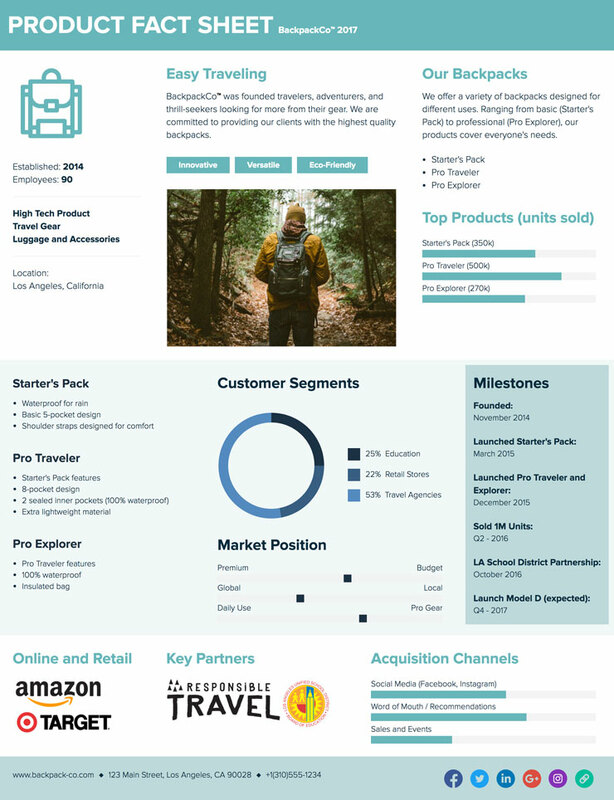 Try Xtensio’s User Persona Template below for a deeper analysis of your customers. 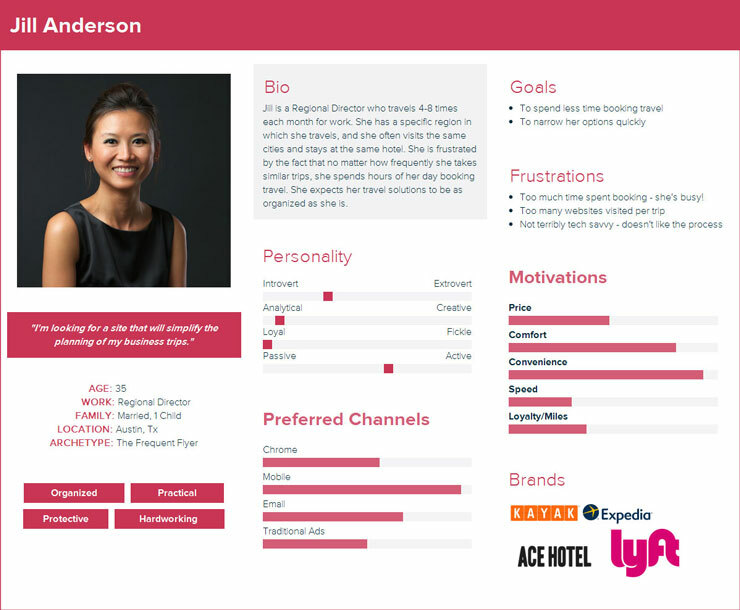 You can also use your findings from the User Persona Comparison to draw a high-level picture of your customer segments. Starting with key players such as Founders and Executives, give a quick intro of your team members and link to their individual profiles (LinkedIn, AngelList, etc.). Feel free to use our tag modules and other features to modify this section to align with your fact sheet’s purpose. For larger companies where it’s not applicable to list out every member of your team or management, you can focus on an overview of your enterprise’s departmental breakdown or organizational chart. After you complete your fact sheet, you should consider ways to distribute it to your intended audience. Do you want the fact sheet to reach as many people as possible by making the folio searchable in web search results? Or do you want it to only reach a few potential investors? Xtensio’s features allow you to share your fact sheet on a variety of mediums and control access levels. The three examples above are all made with Xtensio’s free template and purposed for specific audiences. As shown, they are each organized to emphasize particular segments of information. 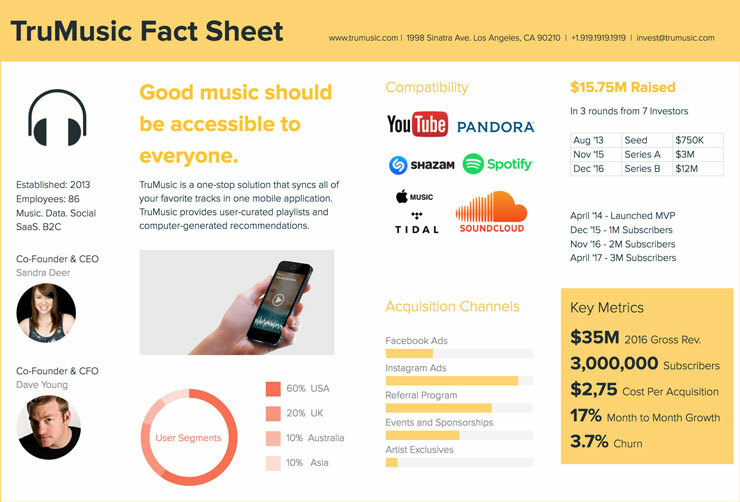 For example, TruMusic’s startup fact sheet focuses more on business operation and growth to appeal to potential investors, while BackpackCo’s product fact sheet highlights different models and features to provide customers with better insights into their merchandise. Think about how you can make relevant information pop for your audience as you organize your fact sheet. 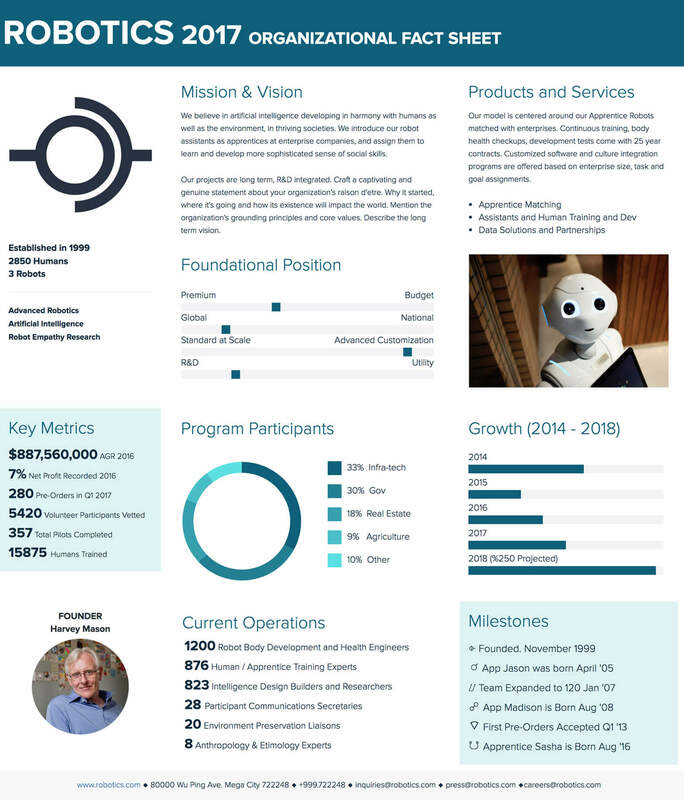 Why use Xtensio to create a Fact Sheet? The Fact Sheet template is not set in stone. Like other Xtensio tools, it can and should be repurposed, revisited, and revised to suit your evolving needs. You can always add, delete, and move your modules and sections around with Xtensio’s versatile editor to adapt the fact sheet as you need it. And your team can collaborate on your fact sheets in real-time, making sure everyone with the link sees the latest updates as they are made. This multipurpose business essential can help you attract investors, reach new customers, recruit new employees, and reach many other goals.